Two things that have been on the top of my Days of Our Lives wish list: Jack Deveraux's return and DAYS addressing an important social issue. On the surface, this mayoral campaign storyline fits the bill, and there are certainly aspects of it that are compelling. But from the beginning, this story has borne no resemblance to reality -- and I'm not just talking about Jack magically returning from the dead via a resurrection potion, either. On Days of Our Lives during the week of 4-1-19, this story hit a new low as Tripp and Haley struggled to convince an ICE agent that they were in love so that she could stay in the United States. The actors are doing a great job with this silly story, but it's so ridiculous it's hard to take seriously. Haley announcing 30 seconds after she is ordered to be deported that she's marrying a US citizen has to be the most obvious ploy ever. No way would this application even get to the interview stage! And then the interview consisted of... a tough-as-nails woman going over what she saw on Tripp's social media about his love life and why Haley kissed her former roommate weeks ago. Really? An overworked government official has time to look at people's social media and listen to rumors about their love lives to determine whether their plans to marry make sense? I somehow doubt this is how this works in real life, and the entire interview was ridiculous. Plus, they didn't finish it. The immigration official said that Tripp might have to go to China to be with Haley, and then the next scene was Tripp and Haley coming home and saying they thought the interview went okay. Something must have happened off-screen, because what we saw was a hard NO on Haley being allowed to stay in the United States to pursue this alleged romance of the century. This story also suffers from a severe case of Character Stupidity Syndrome. Claire is becoming more and more obvious about how much she hates being asked to play the other woman so that Tripp can marry Haley. Every other second she made a sarcastic comment, acted territorial whenever she got around Tripp and Haley, and tried to get JJ on her side since it's clear he wishes Haley were marrying him instead. Yet Tripp accepted every one of Claire's claims that she was just kidding and didn't question her commitment to this sham for a second. Eve: You reminded me of my daughter just then. Eve: Yes. Paige had times when she was cheery and optimistic but she also had moments when she was filled with self-doubt. Meanwhile, Claire went along with a scheme that was sure to blow up in her face. She pushed Tripp and Haley to go to Jack's rally and pushed Eve to reveal the tape of Tripp telling Claire that his marriage to Haley was phony. But how was that going to get her Tripp back? Wouldn't it be obvious that Claire betrayed him and Haley when a video of his private conversation with Claire in a hotel room she insisted on going to surfaced? Wouldn't that make Tripp dump Claire forever? Of course, with Tripp being written as so stupid and oblivious, maybe he would believe this was all a terrible coincidence, but nevertheless, this doesn't seem like a very good plan. Claire has bigger problems to worry about anyway now that JJ has discovered the lighter in her jewelry box. Her extreme reaction every time anyone mentions it proves she has something to hide. JJ keeps saying he wants to prove Ben set the fire and then put the lighter in Claire's jewelry box, but does he really believe that? I hope not! It's again obvious that Claire did something she shouldn't with that lighter, and claiming to be suspicious of Ben would be the perfect way to gain her trust. I've been enjoying JJ's interactions with Claire and Tripp. Too bad he's never spent much time with either of them outside of this storyline. 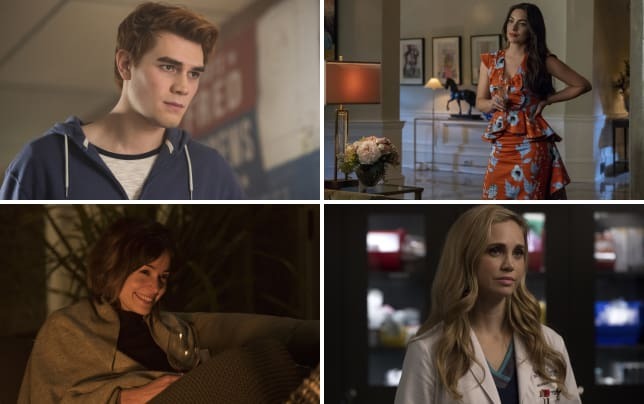 Tripp is his cousin, and this whole cousin vs. cousin competition over Haley they got going on would be more impactful if JJ and Tripp had any kind of relationship at all. The two would be natural best friends, since they both used to act out their pain in destructive ways that gave them poor reputations and criminal records, and they also could have been allied in their dislike of Ben when he was living at the loft. But without any on-screen relationship to speak of, the conflict over Haley falls flat. Similarly, Claire and JJ are distantly related, since Claire's grandmother is JJ's cousin. And the two have a love of music in common! JJ would have been a natural mentor for Claire and her interest in pursuing a music career could have reawakened his interest in pursuing his own, which died when Paige did. But instead, JJ has had nothing to do with Claire other than trying to protect her from Orpheus back in 2017, so his reluctance to implicate her in the fire and her anger that he could suspect her lack any emotional punch. And can we back up for a sec to this whole Claire set the fire thing? Not only is it out of character for Claire to turn violent against the aunt she both idolizes and wishes she could be, but it doesn't fit the story. When Ben was living at the loft, Tripp planted false evidence that Ben set the fire in the cabin, all without a single guilty look on Claire's part or relief that Tripp's actions would keep the spotlight off of her. But six months later, Claire suddenly was the culprit all along and is totally freaked out every time anyone notices the lighter that she hid in her jewelry box. Are the writers making this one up as they go along or what? There were a few good things that came out of the messy Jack storyline. We got a great line out of JJ when the video failed at the rally! That's your big announcement? That screen is as blank as Jack Deveraux's brain! Permalink: That's your big announcement? That screen is as blank as Jack Deveraux's brain! I was waiting for JJ to say something to disrupt that ridiculous rally. I thought that he, Haley, and Tripp could have joined forces to turn Jack's anti-Haley rally into a pro-Haley rally. That would have been fun to watch! And I have no doubt that those "technical difficulties" were part of Eve's plan all along. Eve wanted an audience for her plan to stick it to Jennifer, which overshadowed any political points she thought she could help Jack score with this nonsense. I'm not even sure Jack knew Eve was planning on marrying him or is going to go along with it! I also enjoyed Abe standing up to Jack and telling him that the man he used to be would never do half the things Jack was doing. It had the opposite effect of what was intended -- Jack just dug his heels in more -- but it was a strong speech that reminded me of the moral-compass version of Abe that hasn't been seen in a while. But please, Abe, let's not follow that up with a romance with Sheila! Abe putting his hands on Sheila's shoulders made me uncomfortable. It went way beyond an employer/employee interaction and regardless of Abe's intentions it felt inappropriate. And then he went beyond that, appearing to be going in for a kiss. There's already enough one-sided kisses of dubious consent on this show without Abe going there too! Plus, Sheila was recently Lani's competition for Eli, so a romance between her and Lani's father is weird. It's less annoying than this Rafe/Hope/Ted triangle, though. Rafe and Hope have never been my favorite couple, to say the least. I'd love for them to break up, but in the meantime they seem to be in a race to the bottom to see who can be more wrong. There was absolutely no reason for Rafe to cancel his anniversary dinner plans with Hope to go tell Jordan that he'd found Jordan's baby. It wasn't an emergency and whether or not Jordan trusts her doctors is not his problem. If it's protocol to deliver messages to patients through their doctors, then that's what he should do. Plus, why couldn't they schedule things so that there was room in the day both for his visit to Jordan and an anniversary meal? I need you, Rafe. I need you here. I need you on the force, not running after some baby that might not even exist. Score one point for Hope. But Rafe also had a point that Ted is always hanging around Hope. Hope could have shut down Ted's interference in her conversation with Rafe about who should take care of the baby instead of letting Ted gloat. And when Rafe decided to cancel on her, there was no need for her to put on her best funeral clothes and go drink wine by herself. Her pity party seemed designed to give Ted an excuse to kiss her again, and that's exactly what happened. It's also annoying that Ted seems to be a cheap copy of Aiden. When Aiden returned in 2016, he became the DA so that he could blackmail Hope into being with him, then came to his senses and left town. Now we have another crooked DA with designs on Hope for Rafe to be jealous of, only Ted is 100 times more evil than Aiden, whose problem was more than he was unwilling to stand up to Andre Dimera than anything else, ever was. We already had this story with a more compelling character, so why do it again now? Meanwhile, across town, Will and Sonny waited anxiously for Will's test results. This would be a fine story if it wasn't for this evil eye nonsense. 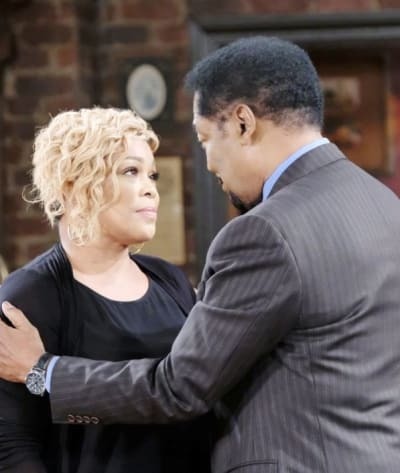 Illness stories are a soap staple, and Sonny and Will fighting a disease TOGETHER is far preferable to all the stupid interloper stories we've had since Will's return. 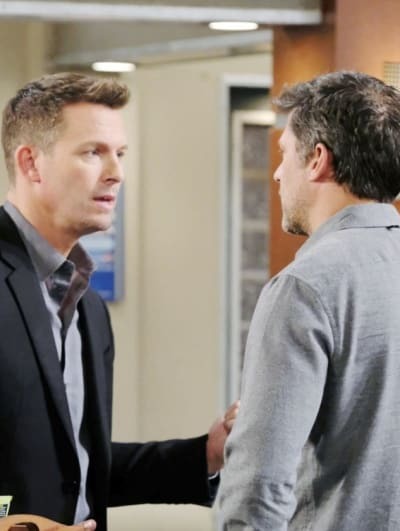 Plus, it gives Rex something to do other than fight with Eric and Brady about Sarah. I was proud of Eric for not allowing Brady to blackmail him. It's about time someone stopped a blackmailer in his tracks, even if Eric did need Sarah to start that ball rolling. But that's about all that can be said for this story. Maggie's contention that it was her job to protect her 32-year-old daughter from making the mistake of marrying Rex was ridiculous. She said what she had to say to Sarah. Now it's Sarah's decision to make. And yes, Sarah is the queen of impulsive decisions and acting like she's still 15, but that doesn't make it Maggie's job to make decisions for her. Maggie should know from Alcoholics Anonymous that that's just enabling and that it doesn't work. Sarah: So I have news. I'm engaged. Victor: Engaged in what? OH to get married! How lovely. Did Xander knock you up? Sarah: You told him about that? Victor: My dear, I know everything that goes on in this house. Permalink: My dear, I know everything that goes on in this house. Victor cracked me up with his take on the entire nonsensical Sarah drama, even if Maggie didn't particularly appreciate it. Speaking of which, what was with Kate insinuating that Maggie had turned Victor soft? I hope a breakup for Maggie and Victor isn't in the works, because they are one of my favorite couples and the writers have not done them justice in a long time! Your turn, Days of Our Lives fanatics! What's your take on Haley and Tripp's marriage plans, how obvious Claire is being, Hope and Rafe's argument, or all other things DAYS? Hit the comments with your thoughts, and don't forget to check back on Sunday for our Days of Our Lives Round Table discussion. Days of Our Lives continues to air Monday through Friday on NBC. Check your local listings for airtimes.